Today sees the launch of the Green Art Lab Alliance (GALA) funding guide, one of the outcomes of a two-year project (2013-2015) in which 19 European organizations worked together to explore environmental sustainability through artistic work and practice. The guide is the first inventory of public and private, international, European, national, regional and local funds, calls, residencies and initiatives that support arts and culture projects on environmental sustainability. Coordinated by On the Move, supported by COAL and edited by Julie’s Bicycle, the guide aims to help artists and cultural professionals access funding to experiment, develop best practice, and create artwork that engages the public with issues relating to environmental sustainability and climate change. It can be downloaded directly from the GALA project website. 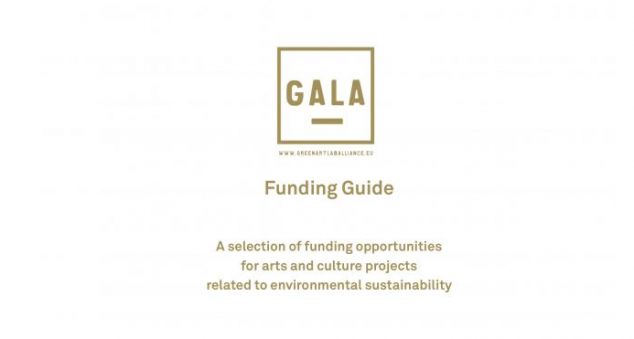 The guide was compiled by partners of the GALA project and is a legacy of the work and research carried out – we hope it will stimulate the development of further projects and future collaborative activities linked to sustainability and the arts.